Rhizome with numerous stems 3-8 cm. Rosette leaves lanceolate, 7-11 cm long; flowers solitary, bright violet, 2-4 cm long, sessile. V - mid spring to early autumn. Fl - June-August depending on locality and elevation. Fr - in July-October. Pr - by seed. Requires a sunny position, humid air and limestone soil. Suffers from excessive water in winter. Well suited for the rock garden. Z 4. New. Caucasus, Anatolia and Balkan Peninsula. In meadows in the alpine zone. A closely related species is G. grandiflora Laxm. from southern Siberia and adjacent Central Asia. 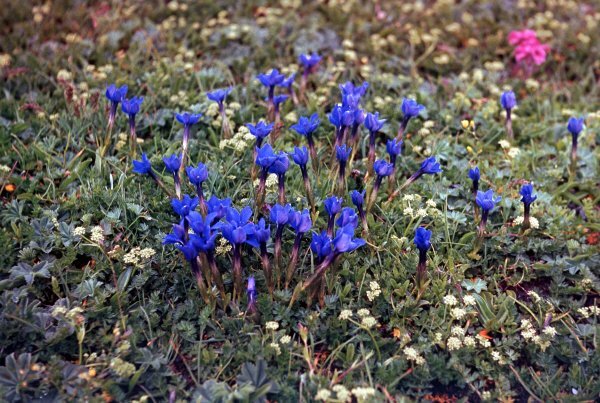 A low-growing plant (2-4 cm) with numerous, large (2.0-2.5 cm), dark blue flowers.